Today Stefan checked me out in the Jabiru 400 that I was planning to take on my long cross country trip (can't take the Mooney for insurance reasons, you need 50h in a complex plane). 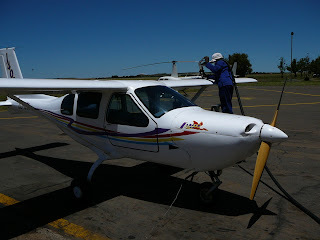 I didn't quite like the Jabiru - it is wide and comfortable, but the controls are located differently than in a Cessna. 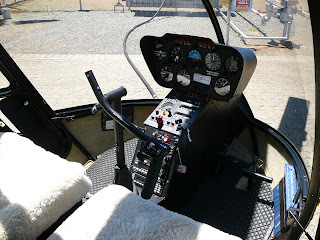 There is a central stick that you control with your right hand as PIC, the throttle is below the seat between your legs, the brake is a lever on the center console (no differential braking). It feels weird, and it is not trivial to both steer and brake simultaneously. The controls are very direct, but do not give pressure feedback as in the Cessna or Diamond, so you don't notice easily that you reach the margin of the flight envelope. Lastly, the approach is flown very fast, and if you cut back the engine, this thing sinks like a brick (nearly 1000 fpm). Not quite my cup of tea! This is the Jabiru. It has serial number 5. 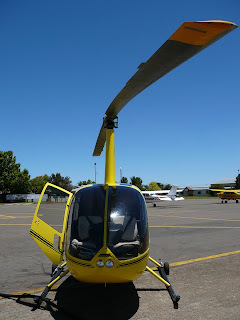 A Robinson R44 helicopter. Lots of helicopter flying and training in South Africa, a lot of it for gaming and hunting. 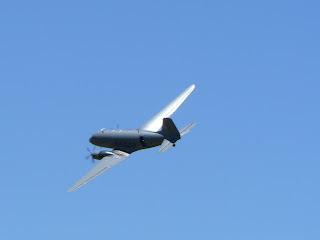 The DC-3 still dropping parachutists. Flying the Jabiru J400 (FATP) was published on November 22, 2006 .